The familiar feeling of invisibility settled in as Dr. Gladys Ato found a seat among 500 others in her introductory college class at the University of California, San Diego. As a child, she always preferred to fade into the background away from the taunts of bullies and the critical eye of attention. 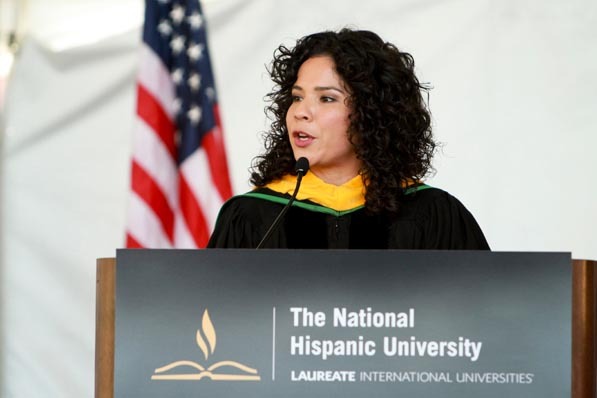 Now, as an undergrad, the future president and provost of The National Hispanic University (NHU) sought the same shelter that anonymity provides—only this time, her father wasn’t there to force her to confront her fears. Ato never relished the spotlight. It was only by her father’s mandate that she competed with her school’s forensics team from 4th through 12th grade. That his daughters would go to college and create better futures than the poverty from which their parents came from in Mexico and Peru was never in question. It was through migrant labor that Ato’s mother moved to the United states and met Ato’s father in Livingston, California. They began a family, both determined their daughters would only inherit their work ethic, not their line of work. Ato found a new community on the San Diego campus where no one held any preconceptions about her. Where she could experience the messiness of defining herself without caring who could see. Free to grow into herself, she began to discover her strengths in listening, empathizing, and helping others heal. Her interest in psychology grew. Pursuing her clinical psychology doctoral degree and license, she provided therapeutic services to combat veterans in Albany, New York, and worked extensively with children and families with trauma in various hospitals and mental-health centers in Texas, New York, and California. To achieve this Ato is focusing on academic quality and student retention, specifically asking what she and the university can do—from the moment students enroll to their first jobs as alumni—to support their success. One area that Ato hopes to expand is online course offerings. Making them more widely available to students, particularly more Hispanics, studying out of state would make the university truly national. More than just opening the courses, however, Ato wants to ensure that every student, online and on campus, feels like familia at NHU, what she says the university represents.